And pray tell; what is a knitting bobbin? What does one look like? Christa do you do the loops (?) after the ribbon is woven? No you weave them in. Because you need the 'space' for the extra thread of the loops(funny word ). So the loops are actually the weft? Found this and think it is interesting. Last night I was surfing the Victoria and Albert Museum's website for embroidered caskets on their website on our flat screen TV. I am contemplating the embroidered design for a life size casket and then want to make a 1/12th scale model of my life size piece. When I was reading the details, they indicated metal braids were used for the life size casket, and suddenly, "aha" could I make metal trim with wire and an inkle loom? of course it would have to be very, very, very thin wire that is not hardened; so it is easily manipulated, and I would have to find a suitable fiber to weave over the warp, but could I make my own wire braid?? I am wondering if I can miniature trim for my Mark Murphy Casket from Annelle's 2009 GS class..., and increase the size of the metal trim for my life size casket. I've brought home some spools of vintage metal trims from Tinsel Trading from my last 2 visits at the New Jersey Guild Show. I bought them with the hopes of incorporating some of the metal in my embroidery for my life size casket. Museum Number T-43 - 194. Click on the More Information tab if you are interested in seeing it where it refers to metal braid. If you are watching Netflix, hulu, amazon prime on your TV with your blue ray; you can search the internet on your TV, wow, seeing these pics on my flat screen TV, and then enlarged... vs a computer monitor is incredible! Christa, your trim in your photo album is exquisite. Oh, I want to learn more! Now you are making me think Tamra, when I was in Tune this year one of the Swedish ladies, Marie Kallberg, gave me some 0.05mm thick stainless steel surgical suture thread...it should work great together with some of the really fine silk threads...wonder if I could build my own little loom. You got the right knitting bobbins, Missy! They're the exact ones I just ordered for my Kensington and Guild School classes next year. I can't find them locally, just wider ones that won't fit into the shed. Bill, when I said the fringe is a supplemental weft, I should have been clearer. 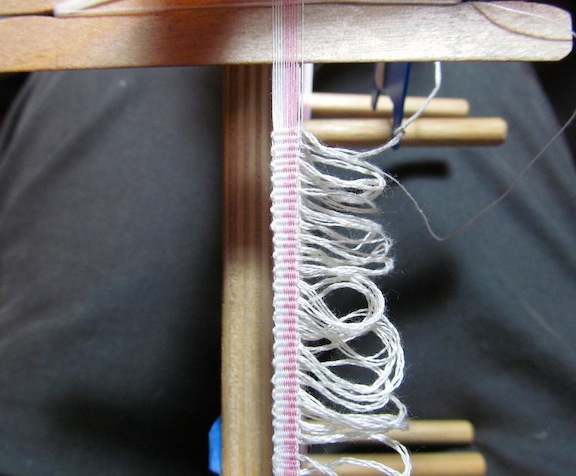 You use both the normal weft on the beveled shuttle plus the fringe weft. Either alternately (each one weaves in the same shed) or if you have a stripe in the warp that you want more dominant on one side, the normal weft makes two trips, then the fringe weaves in the same shed as the last trip the normal weft made. Having the normal shuttle doing what it always does gives a stable tape, so even if you were to pull the fringe out, you'd still have a woven tape. The bullion fringe video was great, I've pondered long and hard how to make that in miniature. I had the jig for length figured out, but hadn't quite worked out how to twist the fringe consistently as I wove. Now I know that the fringe weft gets plied in advance, installed on a spool and woven from that. Only for the insane or truly driven to attempt! I'll include the how-to in future passementerie classes, but not attempt to provide the equipment. I haven't tried weaving metal on the Greta, but I wonder about keeping it warp faced, with just a silk weft. There are some very fine blending threads that look metallic but aren't, out there. I've used those as weft and it makes a shiny border on the edges of the tape, the only place the weft really shows on the tape. Actually, if you are going to play with wire, but don't want to start with building a loom, why not try braiding? When I went to watch the video mentioned above, there were a couple of other videos that came up, and one was on loop braiding. found it easier to go to youtube to watch them, since there you can go full screen. You might want to watch these videos: https://www.youtube.com/user/loopbraider. it would be easy enough to replace some or all the loops with wire. I was just fascinated by this type of braiding, and now I want to try it, but don't know if I can with some of my finger joints no longer bending due to arthritis, it may be too difficult for me to do. If not, I am going to continue on with Kumihimo, and maybe replace a couple of strands with metallic machine embroidery thread, since I don't have a source for wire that would be fine enough. But in mini scale, who would know it wasn't wire? it would definitely be easier to manipulate. Here is a neat tol for making ropes or wound yarns etc. for passementerie. That is an interesting tool, but....I want one that uses 4 strands in stead of 3, which is what is used or ply-split braiding. I have done some of that, and am thinking to see if I can use fine enough threads to be able to use it for miniatures. it would be kind of neat to be able to make some of the baskets in miniature....https://www.youtube.com/watch?v=JOpomKQe5Oc#t=168. This is the fringe twister/cord maker I give to my students to make cord. In the past I've supplied a 3-clamp version, but these folks seem not to make that one anymore, so I'll be ordering the 4, as shown. 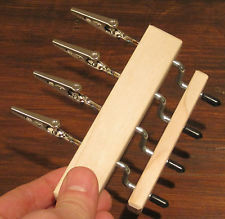 You can use as few as 2 of the clamps, so having 4 just gives more options. The limitation to the ship modeler's version Bill shared is that you have to make that one length of cord. With the manual one, it's up to the maker how long it should be. The "dumb" end of the twister is a hook on the wall, and one just moves forward while twisting to allow for the take-up that torque requires. I like the motorized version shown in Marianne's Youtube video for the percentage marks on her table that allow consistent results, but again, one is restricted to one length of cord. 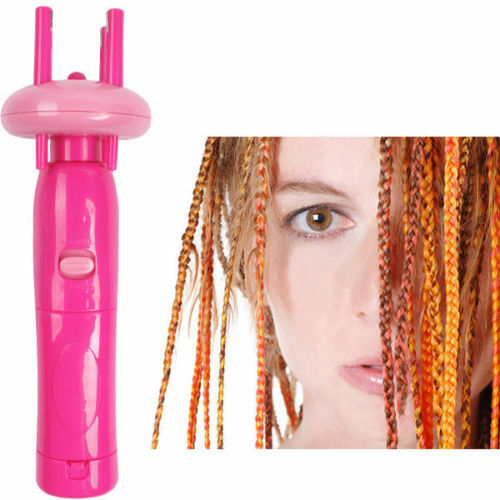 Another option for those who don't want to crank and crank and crank is this battery operated gizmo, intended to create faux braids.These used to be sold by Conair and marketed as the Brittney Spears hair braider. It has 4 clips that spin one way to put torque in the strands, then all the clips rotate together in the opposite direction to make the plied cord. Mechanized, just like the table top ones, only you get to choose how long a cord you want. 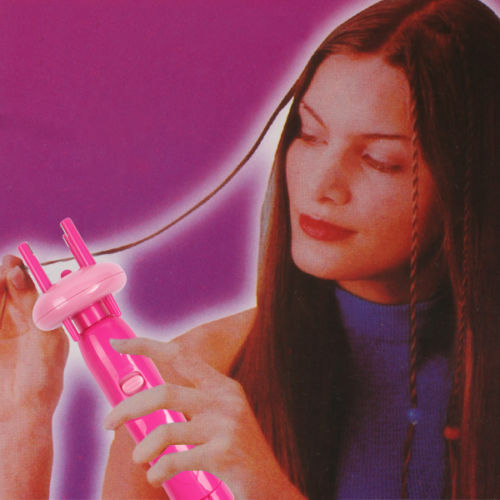 For the record, any grown woman I've shown mine to has said "that would rip the hair right out of your head!". Evidently teenage girls don't worry about those things. I have several of the original Conairs and have also bought these from China. The Chinese versions are definitely flimsier, but still work. The first photo is deceptive, showing actual braids instead of cords, the second picture shows reality. Note that the second step, reversing the spin of all the hooks or clips together can also be done by releasing the ends from the hooks and allowing them to twist gradually, by sliding your hand up the cord. If you release it all at once you still get cord, but it might have kinks in one ply or another. The twisters create the illusion that by spinning more in the second step, the cord is tighter. But it's not. It's only as tight as the torque you put in in the first step lets it be. The advantage to cranking it manually is if you want to make a fancy 3 ply cord where one of the plies is two colors pre twisted together. That ply has to be cranked in the opposite direction in step one, or it just unplies when you make the final cord. I actually have the one in the first picture (I am a floor loom weaver as well, and need it to make fringe). I have used it to make cords for ply split braiding. I tie the ends to hooks, and make the first half of the cord that way, then once it starts kinking, i transfer the ends from the twister to the hooks as well, and use my mini kreinik custom corder to twist in the other direction. I just thought the ships modeler was a little faster to use, and when you read the directions, you can make cords as long as you want, you are just limited by how far apart you put the 2 parts. . You only clamp the end module while adding the thread, once the threads are tied you take the clamp off, and let that end creep closer while twisting. Btw, you can still get the 2 and 3 clip ones from Leclerclooms.com. Back on the Greta. Taking a break away from the tin to watch Oregon Ducks vs Colorado Buffalos. Oregon won 44 to 10. I decided to take the time to warp the Greta. It took most of the whole game to do so. This is the answer to Bill R's suggestion of watching TV while weaving. I kept having to re-warp several ends several times before I finally got it warped. This was the most ends (26) I have done so far. The pattern is an Egyptian Key. I think this will be another favorite for me.. I like the twists and turns of this (forum) thread; weaving (puns intended) in and out with various related subjects- passementerie etc.- close to weaving on the Greta. I am learning a lot of new things to me; Please do keep them coming. Looking great Bill, what kind and brand of thread are you using? I'm using Mettler and Presencia # 50 100% cotton with silk finish on this one. I used Guitermann # 50 on the last ribbon. I don't see any difference between them. I'm not sure what the weft is, it is purple; something Bonni sent to me with Greta. A real unexpected find today. While getting my monthly blood test, nurse Bob told me about Eugene Textile Company. --Bob sews and machine embroiders; we both are hooked on dragons --. Turns out the store is about two miles from our house. I took my tapes with me and showed them off. They were well received and the clerk told me about a weaving club that meets there. ETC is a fun place to visit. Rooms of looms and all kinds of fiber and yarns; to much other stuff to take in at one visit. I expect I will go back soon. I also found The Weaver's Inkle Pattern Directory book and bought it. I've heard through the grapevine; that weaving was sometimes used for rehab... has anyone else heard of this? Perhaps dexterity and coordination? Bill, ETC, the initials are great. Isn't it cool to find these hidden places in your community? I've lived here for more then 4 decades and had no idea that we had a weaving community in my local art museum. I couldn't believe that I missed this, and remember thinking, I thought I was reading the newspaper; but evidently I was skimming. However, it still would not have meant anything had I not wanted to go to Guild School and take all the classes offered! You have heard of underwater basketweaving, haven't you? For those needing to recover from life? I never looked at the initials in that way. If you go into the store you will see lots of looms etc. so it might be fitting. I do hope this thread isn't going off track talking about therapies etc. Briefly looking through The Weaver's Inkle Pattern Directory, I bought, I see lots of exciting ways to weave on the Inkle. Maybe it is just me but sometimes I think the author is not always clear. I feel she assumes I know what she means and kind of skips - rushes through stuff. I think she should have had Bonni B. write the book for her. I also found out the inkle actually refers to the tapes woven on the loom. They are called Inkles. The adventure continues: advancing into 43 ends. Wider is more challenging as the sheds do not completely open as I would like. I found out I can slip the handle of a crochet hook in the shed and slide it down to better open the shed before the shuttle goes in. If not the shuttle may catch an errant end and weave over or under it and mess up the weave. Believe me it is no fun going back after several passes, to unravel the mistake. Also on this wide of inkle (tape) I find it a little hard, at first,to control the width. 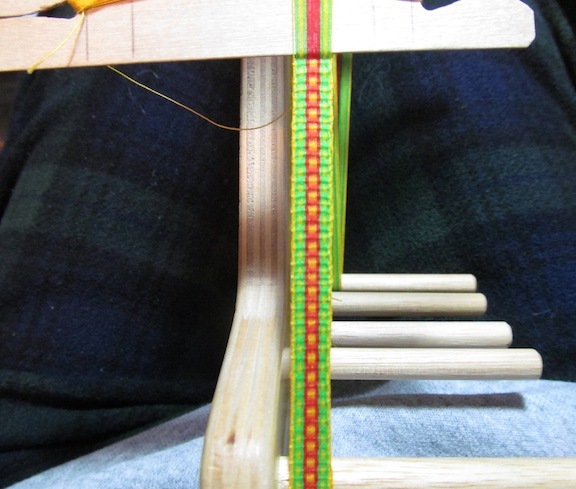 Also with this pattern a dark weft does not look good against the light yellow, I changed to the yellow for weft. Having fun and burning the midnight hours. I am trying to weave some trim ribbon for a baby Pram. I'm not having much luck at it as I really need a very narrow one. 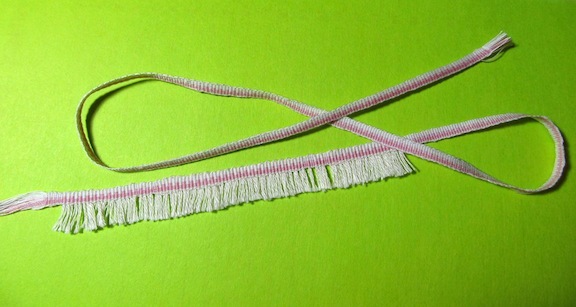 I also want the same ribbon with fringe to trim out the top. Below is my first attempt t fringe.. Too wide and too course. I think I might try tassels instead. Due to neck and arm problems I am not putting in much time at it. I'm no giving up! I did finish off my fringe test. Still more to learn like learning to trim the fringe properly. The ribbon is still too large for my pram so I will have to redesign the pattern to use fewer ends. 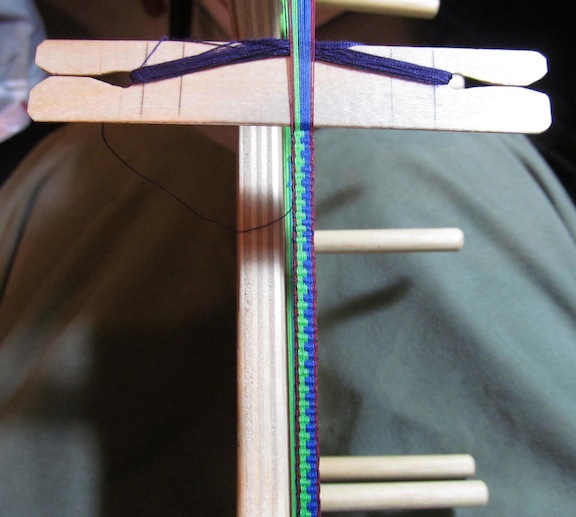 Ok, now you have really done it; I've got to have an inkle loom! I was doing well, until I saw fringe. I love the fringe, and oh, can think of many things to do with this! we could cut the fringe in half circles, instead of straight across, and it could be a wonderful fringe for a gown. How narrow are you going to go? Is that 10 threads wide in the photo?